In business, it’s no secret that consumers prefer to buy from companies that leave good first impressions on them. Such a positive first impression is simply the result of showing your customers that you care about them, and that you’re willing to give them the personal attention they deserve. If your goal is to make more sales, then you must develop a relationship of loyalty and trust with each one of your newly acquired customers. In this post, I will show you exactly how I did this at my Ecwid store Kartis.co.il and how you will be able to automate this process for your own business. It’s true that, in the online world, giving every customer personal attention can be challenging. However, when you take advantage of the power of email marketing automation, you can easily strike up a conversation with each one of your customers with an effective welcome email. By doing so, you can better understand your customers’ wants, needs and challenges and use this knowledge to sell more products and services. What Should You Say in This Welcome Email? Let’s keep things simple for a moment… When you welcome your customers like human beings, and ask them the right questions, they will tell you exactly what else they need and want buy from you. The big idea is to open a conversation with each and every new customer, and listen to what each of them has to say. When you ask your customers What are you struggling with? they will often reply. Of course, not all of them will reply, but those who do will tell you exactly what their wants, needs and problems are. With this information, you will be able to offer them products and services that can solve their problems. 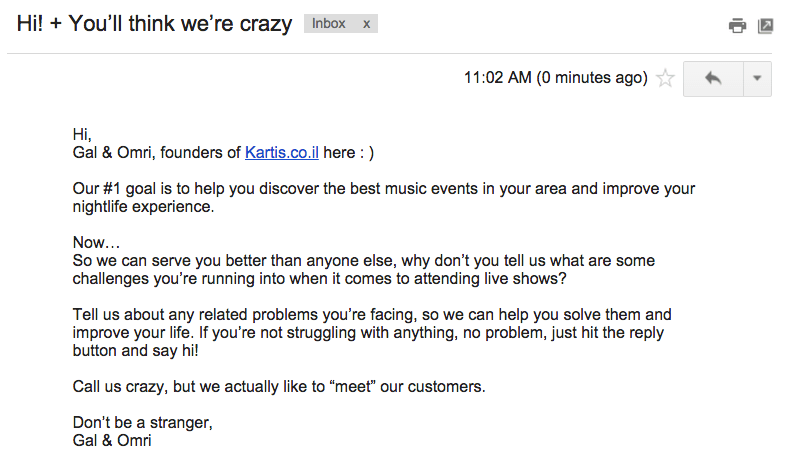 We had no idea what else to sell to our customers, but since we started using this welcome email, we learned that many customers complain about the music being too loud at the venues that we sell tickets to. When I replied back to these customers, I asked if they would consider using earplugs to protect their hearing. Most customers said yes, and that if the earplugs are not overpriced they will definitely buy them. We decided to run a test and bought a pack of 500 pairs of earplugs. Now, back in April 2015, we sold tickets to a pretty big music festival and asked the festival organizers if they will let us sell earplugs at the gate. They agreed, and we ended up selling 451 pairs of earplugs. Each pair cost us 25 cents, and we sold them for $3 a pair — That’s $1,240.25 in profit! Not bad for a first test, huh? Not only did we make some extra cash, but from that moment we started up­selling new customers on our Ecwid store, offering them to buy earplugs to the event that they purchased tickets to. This is just one example of how this little tactic helped us give our sales a nice boost! It helped us discover what else our customers need. When you ask people a question like What are you struggling with?, you absolutely have to respond to those emails. If you do this, you’ll increase customer satisfaction and loyalty, which will quickly translate into more sales. So make sure you reply these emails. I’m 100% certain that it is going to pay off. This will allow you to know what else your customers want to buy, and it will be your duty to sell it to them. Ecwid — We use Ecwid as our e-­commerce platform. MailChimp — Free Email Marketing Platform (It’s free for the first 2000 subscribers). MailChimp Integration App for Ecwid — This is a free Ecwid app that I developed, which automatically imports every new customer into MailChimp and sends this customer a welcome email, pretty cool right? Have you ever tried anything like this? If not, are you going to give this a try? Please comment below and let us know some of your similar tips! Also, do you know any other business owners who are trying to increase their online sales? Well, share this post with them, and they will thank you!